If youâre like most Americans (82% of us own a grill), you canât wait to celebrate Memorial Day, and the long weekend marking the unofficial start of summer, by firing up the grill! David Zinczenko and Matt Goulding, authors of the ever popular Eat This, Not That series, have come out with a fool-proof guide to raise the flavor and health factor of all your summer meals. 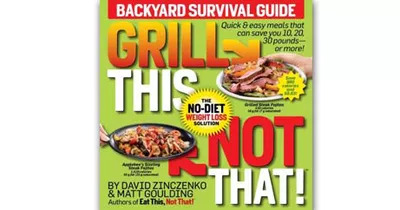 Grill This, Not That is packed with over 150 recipes for sauces and rubs, veggies, beef, poultry, fish and seafood, burgers and sandwiches, and even pizza, pasta and dessert. Carolina Pulled Pork, Sausage and Pepper Pasta, Blackened Chicken and Mango Salad with a Grilled Peaches and Cream Sundae?Â Yes Please! You may not have thought so, but you can indulge in all those tasty recipes guilt-free! Zinczenko and Goudling say grilling at home might be the most effective tool in your weight loss arsenal: the grill melts a lot of fat off of meat, giving you leaner protein. You can also add a lot of flavor without adding extra fat, because youÂ control the ingredients. The guys also answer some of your common summer-eating questions like which BBQ sauces or cheese slices are best. And what about eating out? You know the word fried is a code-red alarm, but it's important to remember the word grilled doesn't necessarily mean healthy either. Grill This, Not That lays out the top 20 worst grilled foods you'll find at fast foods joints and restaurants alike. (Even a turkey burger and fish meal make the list!) Red Lobsterâs Cedar Plank Salmon might sound like a safe bet, but it actually has 1,050 calories and 40g of fat, 9 grams of which are the artery-clogging saturated kind! So whether your firing up your own grill, joining friends at their barbeque, or hitting your favorite local spot, making informedâand decadently deliciousâfood choices is the surefire way to enjoy Memorial Day weekend with a full and guilt-free tummy!